I started washing all the plastic bottles that passed through our home, and putting them on a shelf. They started to become a collection. Grouping through colour became a way of organising them, of classifying. And then I began to make museum-display cases from recycled cardboard I found on the street to exhibit the different parts of the collection. The architecture of the display cases, especially with internal lighting, leant authority. When asked to participate in an exhibition in Salzberg, with the help of the curator I found a family that had a collection of souvenirs from visits to local museum gift shops. I constructed a recycled cardboard display case for the 'African artifacts', and installed it in their home. Cummings continues to investigate the way we construct value – social, cultural and cultural – through material things. This would include thinking about the 'institutions of display', galleries, museums and shops for instance, as well as the artefacts they contain. 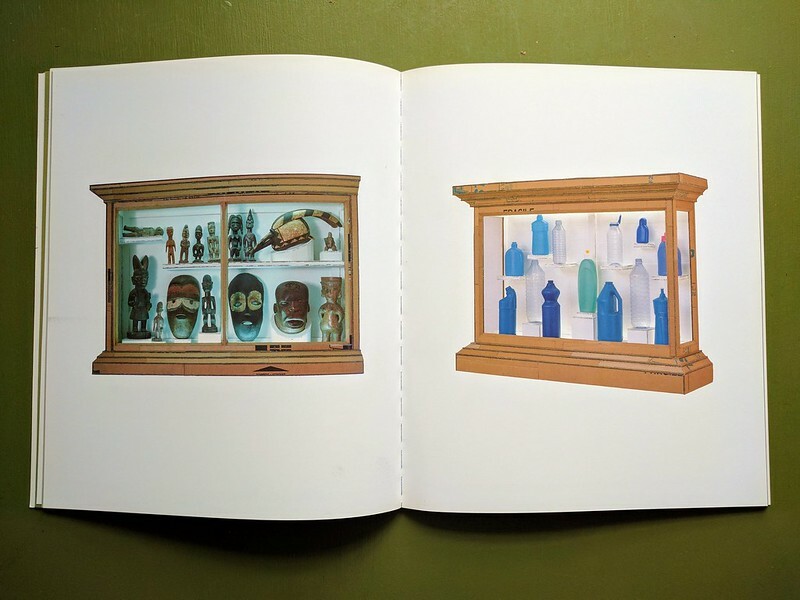 Imagine a museum vitrine, with interior lighting in which plinths present vessels of immediate and luminescent elegance; works of art of obvious value and importance displayed in classic museological convention. Approaching the seductive display across the gallery floor, the visitor discovers that not only does the vitrine lack the heavy plate glass to protect the contents, but that the mahogany was actually of a less solid order; merely found cardboard glued together to approximate the authority of museum display. Just as surprisingly, on closer inspection, the contents of the case turn out not to be important example of Roman glass, but domestic plastic bottles, deprived of their labels and revealing beautiful shades of the palest to the deepest blue. By a process of close attention to the conventions of display, Cummings has conjured from the discarded, a work of effortless glamour and sharp critique.